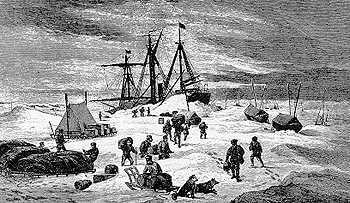 In 1872 an Austrian-Hungarian expedition under Weyprecht and Payer sets out for the Arctic. The journey originates in the theory propounded by a German geographer that a branch of the warm Gulf Stream current might carry a ship near to the pole north of Siberia. Their ship, the "Admiral Tegethoff", a 220-ton steamer with auxiliary sails, is trapped by the ice only a few miles north of Novaya Zemlya. In August 1873, drifting with the ice, they discover a group of islands hitherto unknown. They name this archipelago, located just south of 80' North, Franz Josef Land. Thus, one of the last pieces in the Arctic jigsaw is filled in. In May 1874, they abandon the "Tegethoff". After a tedious 200-mile voyage the explorers reach Novaya Zemlya, relatively unharmed. The illustration shows the "Admiral Tegethoff" trapped in the ice. The crew have carried supplies and boats off the ship, as it seems likely that she will be crushed.